UltraFit tray’s superior adaptability ensures that the maximum amount of gel stays in contact with the teeth during whitening. Ultradent’s NEWEST whitenening product. 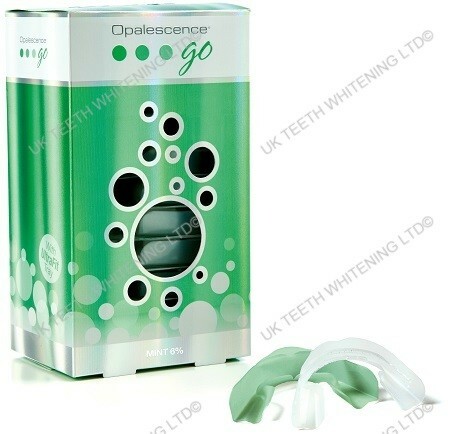 Opalescence Go comes in the innovative, ready-made UltraFitTM tray that adapts instantly and comfortably to the teeth for a better fit and improved whitening experience. Opalescence Go’s unique UltraFit tray material easily conforms to any patient’s smile and offers molar-to-molar coverage, ensuring that the gel comes into contact with more posterior teeth than ever before. The UltraFit tray’s superior adaptability also ensures that the maximum amount of gel stays in contact with the teeth during whitening. Best of all, the convenient, prefilled trays can be worn right out of the package. Additionally, Opalescence Go contains PF (potassium nitrate and fluoride). Potassium nitrate has been shown to help reduce sensitivity. Fluoride has been shown to help reduce caries and strengthen enamel. Together they help to improve the overall health of the teeth.